Pipeline to analyse bacterial genomes. Identifcation of acquired antibiotic resistance genes. Identifcation of functional metagenomic antibiotic resistance determinants. Identifcation of acquired antibiotic resistance genes using Kmers. Prediction of a bacteria's pathogenicity towards human hosts. 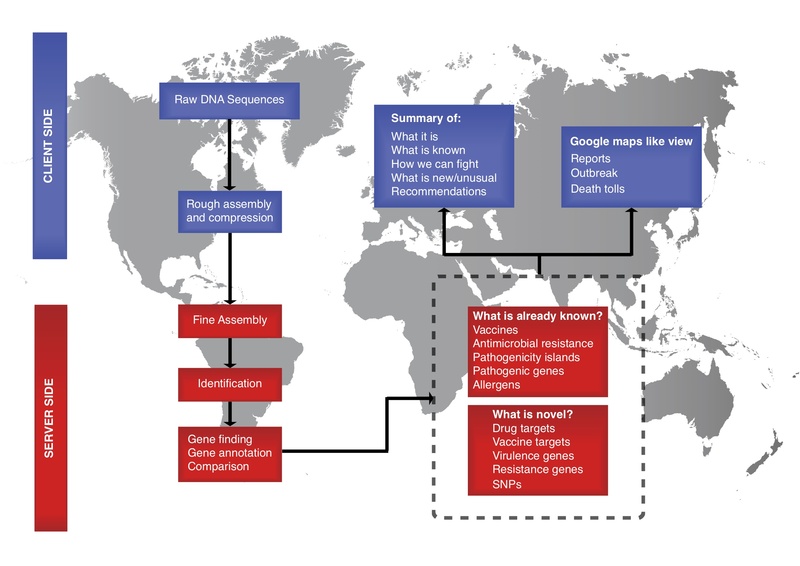 Identifcation of acquired virulence genes. PlasmidFinder identifies plasmids in total or partial sequenced isolates of bacteria. Prediction of bacterial species using a fast K-mer algorithm. Prediction of bacterial species using the S16 ribosomal DNA sequence. Prediction of serotypes in total or partial sequenced isolates of E. coli. SeqSero predicts the Salmonella serotype of either the pre-assembled or raw read sequence data provided to the service. spaTyper predicts the S. aureus spa type. FimTyper predicts the E. coli Fim type. CHTyper predicts the E. coli FimH type and FumC type. CSI Phylogeny calls SNPs, filters the SNPs, does site validation and infers a phylogeny based on the concatenated alignment of the high quality* SNPs. NDtree constructs phylogenetic trees from Single-End or Pair-End FASTQ files. Evergreen generates a forest of constantly updated phylogenetic trees with publicly available whole-genome sequencing data from foodborne, bacterial isolates that were deposited in the short sequencing read archives (NCBI SRA/ENA). The DeHumanizer web-server is a tool for human filtering based on the method described by Zhang et al. The cost of sequencing a bacterial genome is $50 and is expected to decrease further in the near future and the equipment needed cost less than $150 000. Thus, within a few years all clinical microbiological laboratories will have a sequencer in use on a daily basis. The price of genome sequencing is already so low that whole genome sequencing will also find worldwide application in human and veterinary practices as well as many other places where bacteria are handled. In Denmark alone this equals more than 1 million isolates annually in 15-20 laboratories and globally up to 1-2 billion isolates per year. The limiting factor will therefore in the future not be the cost of the sequencing, but how to assemble, process and handle the large amount of data in a standardized way that will make the information useful, especially for diagnostic and surveillance. The aim of this center is to provide the scientific foundation for future internet-based solutions where a central database will enable simplification of total genome sequence information and comparison to all other sequenced including spatial-temporal analysis. We will develop algorithms for rapid analyses of whole genome DNA-sequences, tools for analyses and extraction of information from the sequence data and internet/web-interfaces for using the tools in the global scientific and medical community. The activity is being expanded to also include other microorganisms, such as vira and parasites as well as metagenomic samples.